Giyotin ransomware uses sophisticated techniques to infiltrate computers and hide from its victims. Use Reimage to determine whether your system is infected and prevent the loss of your files. Giyotin ransomware - a file locking virus which urges $60 in Bitcoin in exchange for the decryption tool. 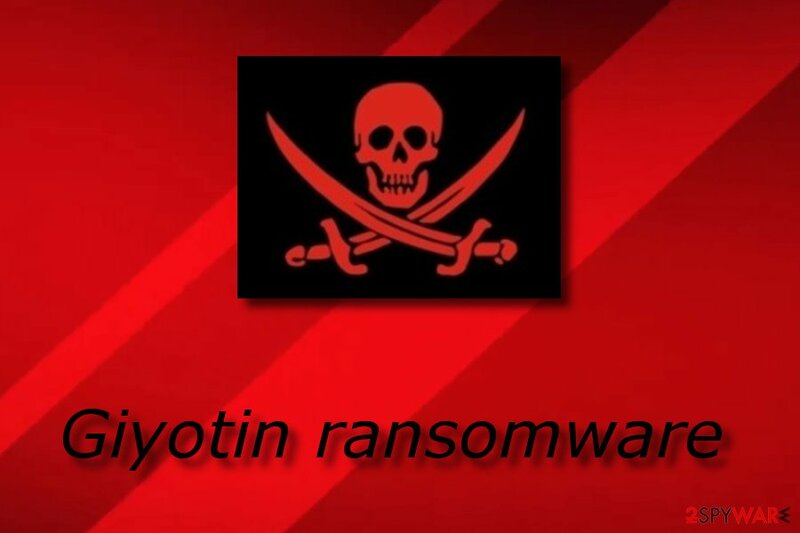 Giyotin ransomware is a dangerous computer virus which shows as the MyRansom.exe file on the infected computer. Once installed, this cyber threat starts its malicious activities by creating dubious registry entries in the Windows Registry section. After that, Giyotin virus encrypts all files that are found on the infected PC and displays a ransom-demanding note which urges $60 in Bitcoin in exchange for the file decryption key. Moreover, IT experts have found out that this ransomware targets Turkish-speaking users and there is a big chance that it is still in the development phase. Even though Giyotin ransomware does not ad any extension to files on the infected computer, that does not mean that the files stay safe. They are still locked by using unique encryption codes and require decryption if wanted to be used properly again. Crooks store all important codes on remote servers which are in reach only for the criminals themselves. However, we do not recommend paying the demanded ransom as there is only a little chance that you will get important data back. Sadly, according to malware researchers, criminals often run off with the money and leave their victims scammed without any decryption tool to use. Better perform the Giyotin removal and then think about decryption solutions. If you are keen on knowing, why ransomware-type viruses, such as Giyotin ransomware, always demand cryptocurrency, we can say that such currency lets the criminals stay safe and unknown. Bitcoin, Monero, Ethereum, and other cryptocurrency transfers do not involve any particular personal information which lets the transferring processes to remain secret and untrackable. You need to remove Giyotin virus to avoid further possible computer damage. Although the biggest problem might seem file encryption from the first view, some ransomware-type viruses have an ability to open paths for other malware spreading. This will just complicate the virus removal process even more. Try using Reimage to eliminate the ransomware infection and get rid of all damaging components from the computer system. ANCAK FAZLA ZAMANINIZ YOK 12 SAAT İÇERİSİNDE BU İŞLEMLERİ YAPMADIĞINIZ TAKDİRDE BİLGİSAYARINIZ KALICI OLARAK ÇÖKECEKTİR !!!! Giyotin ransomware - a dangerous virus which uses unique algorithms such as AES and RSA to block valuable files. If you want to avoid ransomware infections, you should not open spam messages that you receive in your email box. Crooks often attach the hazardous payload to emails and drop them straight to numerous victims. Some gullible users do open such messages and get themselves into trouble. Note that it is better to avoid opening attachments clipped to emails that are sent from unknown users. This will be the best protection from ransomware viruses. Moreover, ransomware can be spread through dubious Internet sources such as P2P networks. These websites might contain damaging content as they often lack security. Stay away from all third-party sources if possible. Furthermore, install a reliable and strong antivirus program on your computer to protect the system automatically. If you have overcome ransomware in your computer system, note that to remove Giyotin virus, you will need to download and install anti-malware software. 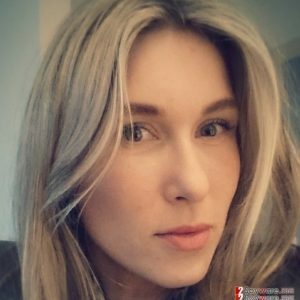 We suggest using computer fixing and security programs such as Reimage, Malwarebytes MalwarebytesCombo Cleaner, Plumbytes Anti-MalwareMalwarebytes Malwarebytes. Manual elimination is not possible for this case as the threat might leave numerous damaging components which might be too hard to detect by the user himself/herself. After you perform the Giyotin removal, you will need to carry out some system backups. This needs to be done to make sure that the ransomware-type virus was eliminated successfully and is permanently gone. When you take care of the cyber threat itself, you can start thinking about data recovery methods. We have provided some solutions for you below this text. Log in to your infected account and start the browser. Download Reimage or other legitimate anti-spyware program. Update it before a full system scan and remove malicious files that belong to your ransomware and complete Giyotin removal. When a new window shows up, click Next and select your restore point that is prior the infiltration of Giyotin. After doing that, click Next. Once you restore your system to a previous date, download and scan your computer with Reimage and make sure that Giyotin removal is performed successfully. Guide which is presented above is supposed to help you remove Giyotin from your computer. To recover your encrypted files, we recommend using a detailed guide prepared by 2-spyware.com security experts. If you have spot Giyotin ransomware on your computer and you cannot properly access your files, you should start thinking about data recovery methods after you eliminate the infection itself. Better try our provided following techniques to get important files back than pay the demanded ransom and risk being scammed. This method might help get locked files back. Look through the following instructions and complete each step with big care to reach the best results. Note that this method might work only under one condition. Make sure you have activated the System Restore feature in the past, otherwise, there are almost no chances that this method will work. If ransomware has blocked important documents on your computer, you can try this method to unlock them. However, it might not work if the ransomware virus destroyed Shadow Volume Copies of encrypted files. Sadly, no original Giyotin ransomware decryptor has been discovered yet. ^ ZonderVirus.nl. ZonderVirus. Spyware news site. ^ Vangie Beal. Spam. Webopedia. IT encyclopedia. This entry was posted on 2018-09-26 at 07:09 and is filed under Ransomware, Viruses. You can quickly scan the QR code with your mobile device and have Giyotin ransomware manual removal instructions right in your pocket. How did you remove Giyotin virus?